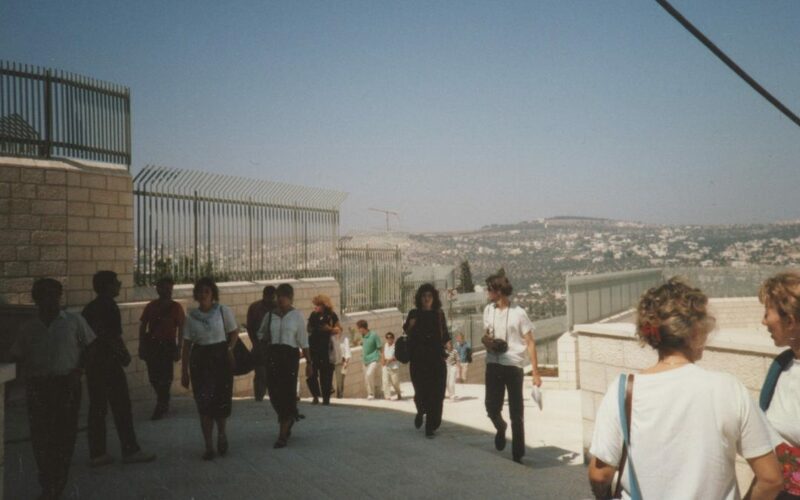 I became involved in Fobzu in 1989, when Fobzu and the World University Service UK (WUS), organised an ambitious delegation of British education trade unionists to occupied Palestine. I went as representative of NATFHE, a precursor of the University and College Union. On arrival, we were plunged into the realities of a harsh military occupation at the height of the popular uprising that was the First Intifada. Universities closed down, with Israeli soldiers at the gate, hospitals overflowing with youths and children shot with plastic bullets or live ammunition visible on their x-rays, Israeli troops actively harassing Palestinians of all ages. We saw this at first hand staying at the Austrian Hospice in the heart of Jerusalem’s Old City, with a neighbouring house taken over by Ariel Sharon, the IDF general turned politician, heavily guarded by overbearing soldiers half blocking the bustling, narrow Via Dolorosa. The oppression and destruction of Palestinian lives was apparent at every level of society, with homes demolished and ancient olive groves ripped up in ‘reprisals’ often for teenage stone throwing. It was also demonstrated at every level of Palestinian education down to nurseries trashed and tear gassed. The delegation visited most of the higher education institutions in the West Bank and Gaza, and a cross section of schools and vocational education centres. We were told about the extreme efforts made to keep classes running out of sight of the occupation forces. We saw the work of UNRWA everywhere, underpinning the stirling efforts of robust but beleaguered civil society institutions and recording the duty of the world community to the Palestinian people. A wide range of internationally supported projects in education, health and community development provided practical and moral support. But it was the spirit of hope and optimism of the Palestinians which impressed us the most, symbolised for me by the old lady in Gaza standing among the wreckage of her house, who said like a mantra, ‘The Palestinians are not weaker than the Vietnamese, Israel is not stronger than the United States’. Another British trade union delegation under the auspices of WUS, went to the West Bank and Gaza in 1993, on a similar mission. In the four years that had passed, things had deteriorated across the board, and a grim determination had replaced the former optimism. It stung with a grain of truth when a local trade unionist said, ’we keep receiving well-meaning delegations from abroad but things here just get worse.’ Since that date of course, there have been huge changes, but the oppression is clearly far worse. The British delegates did mostly go back to their unions and feed into a growing debate that led to more material assistance, greater awareness among our membership of the Palestinian cause, work with Fobzu and other NGOs, and engagement with movements like the wide-ranging campaigns for disengagement with Israeli institutions party to the Occupation. I became a trustee of Fobzu during the 90’s and continued to contribute to a range of work within my own union to keep the Palestinian cause in focus. I served on the Fobzu’s Board of Trustees for about 10 years during which time I was dedicated to using my experience in the trade union movement to further work with student unions and trade union branches in the post-school sector. Today, the task of raising awareness in the UK about the struggle of Palestinian students and educators and fostering hope through projects like the scholarship programme is more important than ever. The Palestinians are confronting a major assault on their rights from extreme right-wing governments in the US and Israel. International solidarity in every sector is vital if they are to withstand these forces. 40 years on from its founding, Fobzu continues to play an important role in harnessing the interest and solidarity of UK higher education community with their colleagues in Palestine and needs our support.